Offering a maximum working height of 51 ft. 6 in. (15.9 m), a maximum horizontal outreach of 24 ft. 9 in. (7.55 m) and an up-and-over clearance of 24 ft. 7 in. (7.5 m), this new Genie XC unit boasts the benefits of a dual-envelope design, providing an unrestricted load capacity of 660 lb. and a restricted capacity of 1,000 lb. New to North America, the Genie Z-45 XC boom is the redesigned Xtra Capacity version of the popular rough-terrain Genie Z-45/25 J RT diesel powered articulating boom. And, it is the first Genie XC articulated boom model, boasting the benefits of a dual-envelope design to provide an unrestricted platform capacity of 660 lb. (300 kg) and a restricted capacity of 1,000 lb. (454 kg), to be introduced to the market. 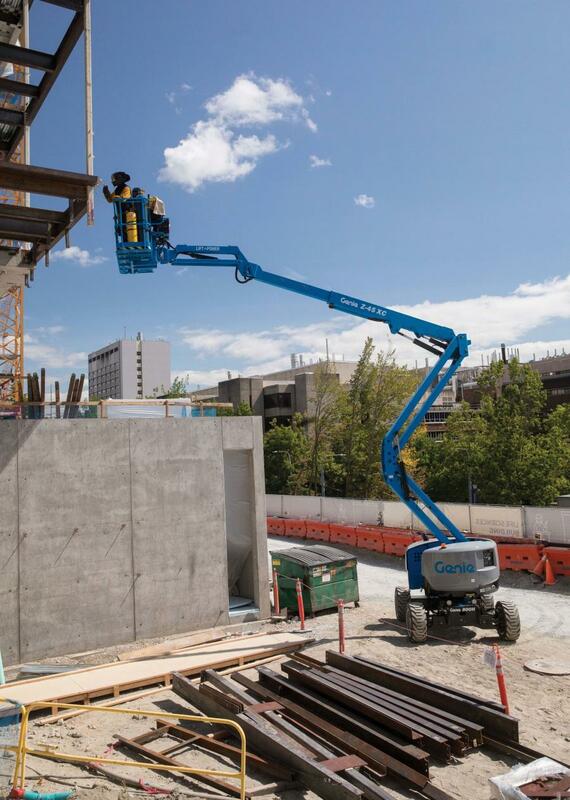 “Providing operators with the ability to perform a wider range of heavier lift and access tasks on rough terrain, using a single machine — without the support of other equipment, the Genie Z-45 XC articulated boom is well-suited for aerial applications on unfinished construction sites,” said Marie Engstrom, Genie product manager, Terex AWP. Offering a maximum working height of 51 ft. 6 in. (15.9 m), a maximum horizontal outreach of 24 ft. 9 in. (7.55 m) and an up-and-over clearance of 24 ft. 7 in. (7.5 m), this new Genie XC unit boasts the benefits of a dual-envelope design, providing an unrestricted load capacity of 660 lb. and a restricted capacity of 1,000 lb. This capacity easily lifts operators, tools and materials to aerial worksites. This model also features the Genie full-time, positive drive traction and an updated oscillating axle system. The refined oscillating axle system is designed to enhance the machine's terrainability, particularly on rough terrain or hills, providing the Genie Z-45 XC boom with up to 45 percent gradeability on undeveloped job sites. Keeping all four wheels on the ground, this machine will climb better in challenging conditions, according to the manufacturer. Offering the cost-effective parts commonality and serviceability benefits shared by many Genie products, the Genie Z-45 XC boom comes equipped with a standard Deutz D2.9L4 48 hp (35.8 kW) and can be driven at full height with up to a 660-lb. load. Other key features of this new Genie XC articulated boom unit include a tight turning radius and zero tail swing to provide the maneuverability required to work efficiently in confined areas, complete with a self-leveling platform with 160 degree hydraulic platform rotation and rough terrain tires. To increase performance, decrease calibration time and improve the overall productivity, this new Genie XC model also boasts the ability to do zero-load field calibration. It is equipped with a load sense cell that continuously checks the weight in the platform and adjusts the allowable range of motion to match the load chart. The Genie Z-45 XC articulated boom is available with the optional Genie Lift Power generator solution. The system includes a dedicated hydraulic circuit, a right-sized breaker and no pressure switch to reliably run the unit, which keeps it cooler and allows for the power to lift and drive during operation. The Genie Lift Power system is available in three options — 3, 7 and 12 kW — to meet the needs of operators worldwide. “Designed with intuitive, proportional controls that offer the high-precision positioning and ease of operation that operators value so highly,” said Engstrom, “operators will find that because of its higher capacity capabilities, they will be able to handle a wider range of heavier tasks with just one machine. The fact that operators will need to reload less often will also help them to save time and work more productively.